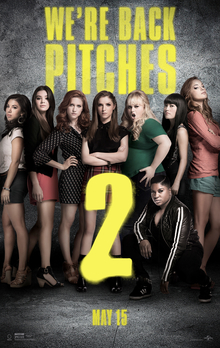 I loved Pitch Perfect. That, to my surprise and delight, was a good film. This sequel is very much a sequel. It’s not as good. It’s not a good film. There’s still some nice laughs and some good tunes, and although the studio pressure to turn this into a series of slumber-party classics is visible on-screen, it has its heart in the right place. So it feels kinda mean talking about all the reasons why it doesn’t work. Instead I’ll just say the film certainly has some high points, particularly whenever David Cross or Keegan-Michael Key are on screen; but what a disappointment that in a film full of interesting women, the highlights are both men in cameo roles. Posted by morgue on Monday, May 11, 2015, at 10:25 am. Filed under Things I've Seen. Tagged film, reviews. Follow any responses to this post with its comments RSS feed. You can post a comment or trackback from your blog.